Howdy kids!! Are you ever in for a treat!! Today I'd like to introduce you to another one of my FABULOUS sponsors, Elisabeth Michael! Elisabeth Michael is a completely chic Etsy store that sells sophisticated modern pillows, shower curtains, drapes and more! Here's just a sampling of some of her amazing products! From now until November 23 Elisabeth Michael is offering a free pillow with every purchase...and she is getting ready to introduce new products for the holidays. Look at this darling stocking!! What a fun addition it would make to your holiday decor! I love these products so much, I even ordered a pillow that now resides in my living room...and you'll see it in my big living room reveal tomorrow! But today, Elisabeth Michael is offering one lucky reader of The Shabby Nest, their choice of any pillow in the shop OR $30 off of any shower curtain! To enter simply visit the Elisabeth Michael shop, then come back and leave a comment telling me what you would choose if you were to win. That's it!! I am so excited about this giveaway. 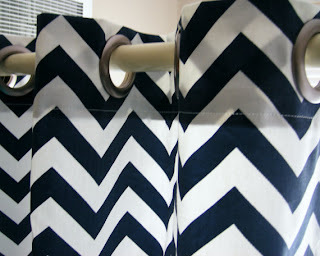 I would choose the Drapery Panels Oversized Zig Zag Chevron Black and White Premier Prints. I would choose the vintage blossom in jade. Though the black and white one would match my living room. Oh my goodness!! How to choose???? I really like the Standard Size Barber Taupe and Powder Blue. it would be perfect. I cant wait to check out more of her site. thanks!!!! I would so totally want the Vintage Blossom in Jade, but I looooove the Alphabet in Gray! 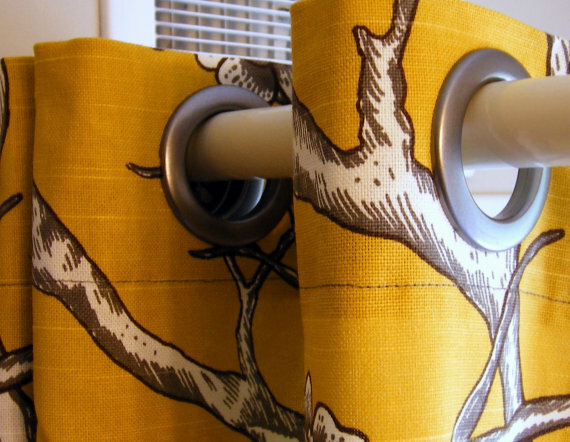 It's different and fun for a home with kids. So hard to choose! I love the Decorative Pillow Cover Dwell Studio Vintage Blossom in Jade! What a cool giveaway! I would choose the Decorative Pillow Cover: Premier Prints Kelp Linen Netherlands. It is gorgeous!! It would be perfect. I cant wait to check out more in your blog. I am so excited about this giveaway. Pillow and that curtain work is splendid. Oh, I like the Dwell Studios Jade pillow cover, the shower curtain of the same fabric and the dark blue zigzag shower curtain. I would get the alphabet gray pillow cover. It would be perfect in my living room. Love her stuff! I have chevron curtains just like what she makes in my dining room. I really am in need of some pillow covers to go with all of my new furniture in my living room. I really like the Navy Blue striped one! Oooo yummy! it would have to be the Waverly Ellis in Turquoise pillow to continue my family room refreshing project! I love the lipstick red and white chevron pillow cover! Definitely love the clean, crisp look of the navy striped pillow. Pretty! I would choose the Decorative Pillow cover in P. Kaufmann Outdoor Woven Slick Aquamarine. Love! i would totally pick the Striped Yellow and White Ticking decorative pillow! I am in need of everything she makes, but since I only have a couple couches and not enough showers I will be absolutely content with the Zig Zag Chevron Lipstick Red and White Pillow Cover. Just Gorgeous! I love the lipstick and white chevron pillow! Love the Spice Damask pillow cover. I love the Kelp Linen pillow cover! I love the fabrics!! 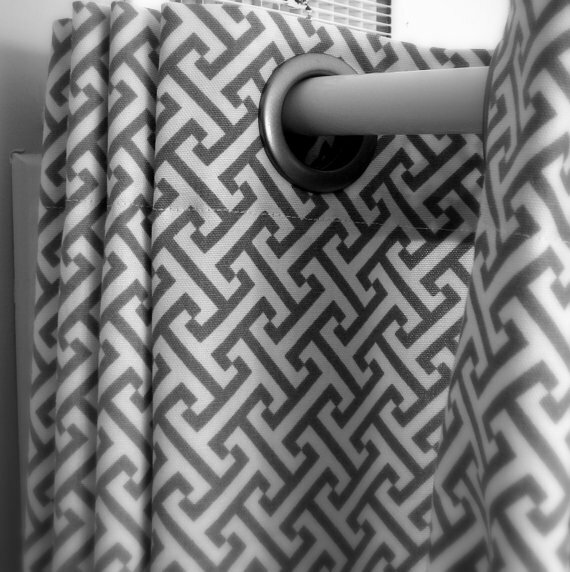 I would have to go with the large Zig Zag shower curtain in black and white! Love the Decorative Pillow Cover Premier Prints Kelp Linen Netherlands. Great fabrics. Im in love with their yellow chevron curtain!!! Decorative Pillow Cover Premier Prints Lipstick Chaz Red and White 20x20, 20 in. What a great giveaway! I would choose the Peony Canary Pillow Cover! It's perfect. 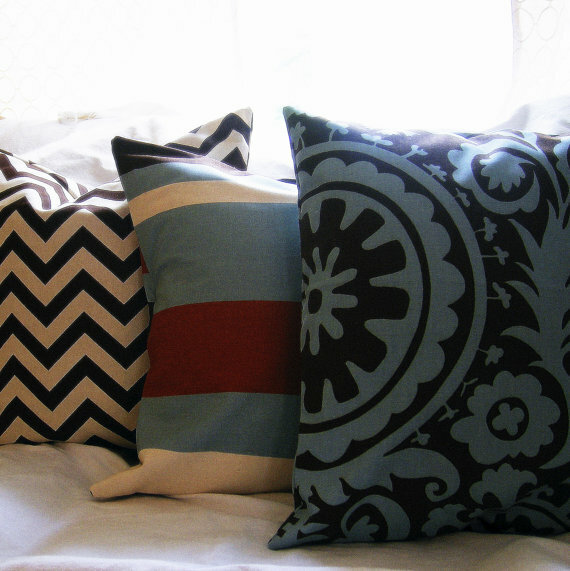 I would love a chevron pillow in green. Pretty fabrics. I like the Decorative Pillow Cover Dwell Studio Vintage Blossom in Jade or the peony canary pillow cover. Tough choice! Anything would be great. Her work is really awesome. I need pillow covers badly. I would absolutely love to get a yellow chevron pillow. I'm trying to give my little girl's room a makeover and that fabric was on my pinterest board! I'm loving the spice Damask pillow :) Yummy!!! I also like the harvest, spice, damask, pillow. I seem to be color challenged, so I'm thinking this would spice up my white and blue color scheme in my living room! 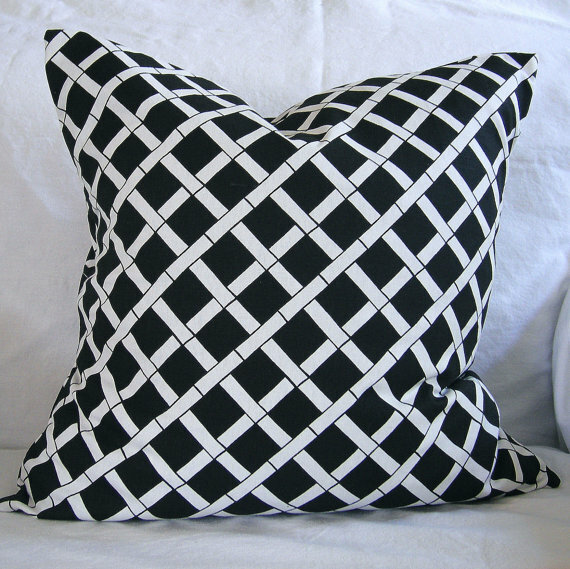 I LOVE the black zig zag pillow covers as well as the gray ones!!! Decorative Pillow Cover Stripe Yellow and White Ticking is my fav! If I win, I may not even hang it in the bathroom, cuz it's so pretty. Might go into the bedroom! I love the chevron, ash grey and white pillow cover. Wow! 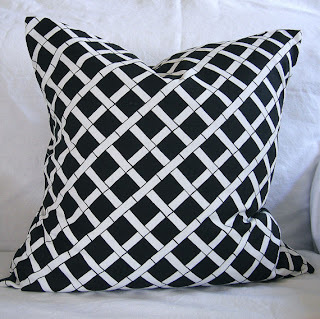 I'd have to get one of those black and white chevron pillow covers! If i were to win, I would want the Decorative Pillow Cover Dwell Studio Vintage Blossom in Jade 20x20. Thanks!!! Very cute shop! I would definitely choose the turquoise P.Kaufman pillow cover. I LOVE her gray & white chevron pillow covers!! beautiful!! 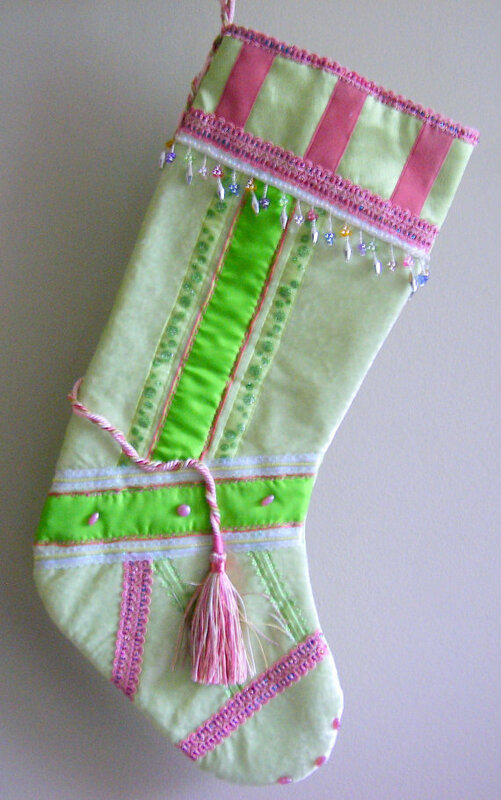 I would LOVE to win the Christmas Stocking Hand Crafted OOAK Turquoise and Lime Green. I would choose the Spice Damask pillow cover! Such great choices. I think I'd have to go with the Decorative Pillow Cover - Corn Yellow Zig Zag print. I would love the Cushion Cover in P. Kaufmann Outdoor Woven Slick Mink. Lovely! I would love to win the brown zig zag chevron pillow cover!